The highly anticipated Samsung Galaxy S IV just keeps on impressing us with awesome new features. Some of these new features include the floating touch and a Green PHOLED display. Similarly to the S-Pen hover technology used for the Note, Note II, and the Sony Xperia Solar, Samsung is bringing Floating Touch technology to the S IV. It will be able to sense your finger hovering above the screen like a cursor. Add that to the eye-scrolling technology, and you won't have to worry about finger prints anymore! Green PHOLED is a new type of display that succeeds the current AMOLED screens, giving 25% more power efficiency, which gives a boost to the battery life while still being able to play full HD games and videos. Rumour has it that the S IV will come with Android 4.2.1 out of the box but will have an update to 4.2.2 later in the month. Some other rumoured specs include a 13 megapixel camera, 2GB of RAM and a Exynos Octacore processor. In just 5 days, the world's newest phone will be announced in Times Square, New York at 7PM EST. 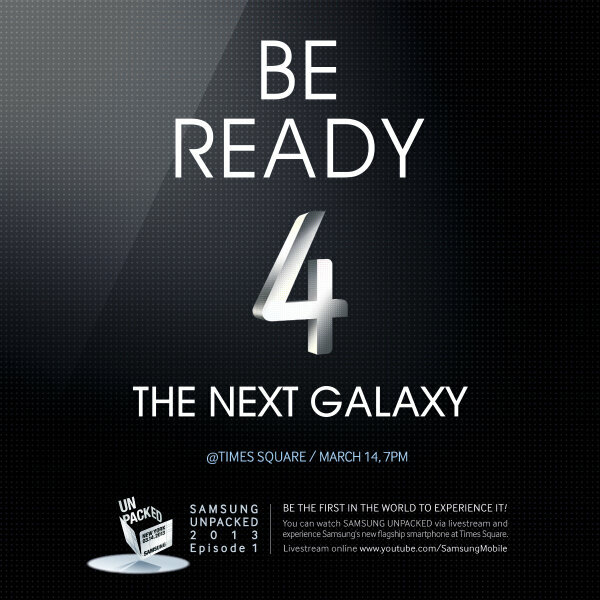 Are you ready 4 the next Galaxy?